A tough test awaits Roy “The Dominator” Doliguez in his third trip to the ONE Championship cage this 2017, but the Filipino veteran believes that he will be the roadblock to Joshua Pacio’s re-entry to the winner’s column. Doliguez squares off with a fellow former world title contender like Pacio on the undercard of ONE: LEGENDS OF THE WORLD, which takes place at the 20,000-capacity SM Mall of Asia Arena in Manila, Philippines on Friday, 10 November. Pacio is being touted by numerous cageside pundits as one of the most promising competitors in the sport today, owning an impressive 9-2 professional record with five wins by submission and three by knockout. The 21-year-old Baguio City native is looking to place himself back on the winning track after yielding to Japanese prospect Hayato Suzuki last August, but it will not be an easy task against a seasoned combatant such as Doliguez. Doliguez, who is also an ex-ONE Strawweight World Championship title challenger, scored the biggest win of his mixed martial arts career last September by stopping Brazilian stalwart Yago Bryan via third-round knockout. Although he only has 11 matches as a mixed martial artist, Doliguez had a satisfactory run inside the boxing ring with 46 bouts it total. During his stint as a boxer, Doliguez captured the WBO Asia Pacific light flyweight belt in September 2002 before he unsuccessfully challenged Fernando Montiel for the WBO super flyweight championship in January 2003. When he transitioned to mixed martial arts in 2011, Doliguez aced six of his first seven assignments, defeating great local talents such as Leo Occena, Alvin Ramirez, Lito Adiwang, Franklin Donglay, Jerome Wanawan and rival Dennis Salazar. 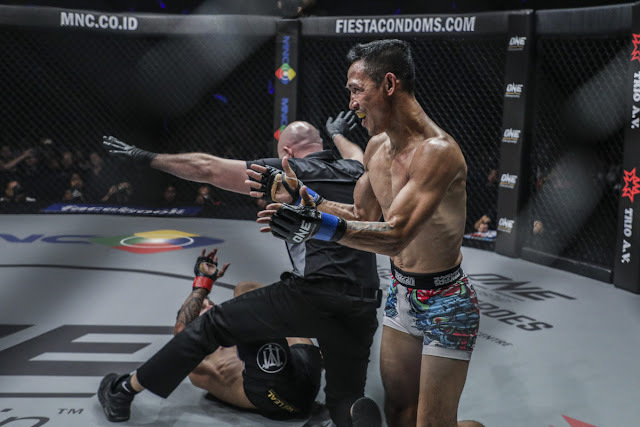 Doliguez stressed that his experience will play a pivotal role in trumping Pacio in their three-round strawweight encounter at ONE: LEGENDS OF THE WORLD. “My advantage coming into this fight is my experience. I’ve face the best both in the ring and in the cage. I am battle tested, and on November 10, my experience will have an important factor,” he said. Knowing that Pacio has gone the distance once in his young career, Doliguez seeks to test his endurance. “He has a bright future ahead of him, but this is a different territory for him. Meanwhile, I’m not new to this. I’ve been here before. If he wants to go full three rounds with me, I am ready. I am best in deep waters of the fight,” he stated. Doliguez admitted that he is fully aware of who Pacio is and what he can bring inside the ONE Championship cage. Despite the worthy praise that he has given Pacio, Doliguez is confident that he can handle the versatility of his Filipino foe. ​“For this fight, I’ve trained as hard as ever. I have continued to improve my overall game. I’ve also worked on my ground skills, both offensively and defensively. I'm very excited to test these out in the cage in my upcoming bout against a talented fighter like Joshua Pacio,” he mentioned. Even though the 35-year-old boxer from Malungon, Sarangani has his hands full at ONE: LEGENDS OF THE WORLD against Pacio, he is more fired up than ever to deliver a winning performance. “People ask me why I am still competing at the age of 35, and I tell them that I just like to do it. I will go on as long as I can because I love martial arts. I love competing. I love training. This is my life,” Doliguez justified. “Joshua Pacio is a human like me, and everyone is beatable. I always put that in my mind. That’s why I confident and focused. I know on November 10 that I will prevail over him,” he ended.